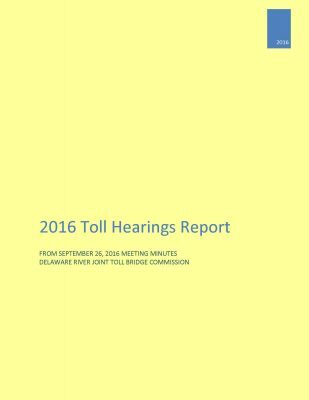 The Commission’s authority to toll has always been rooted in its Compact, first jointly enacted by the two states in 1934 and ratified by Congress in 1935. That authority has been reaffirmed in court decisions and subsequent changes and expansions to the Compact. 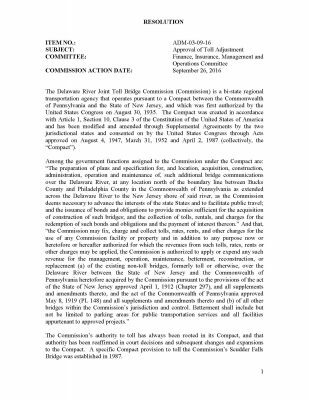 The Commission’s ability to charge tolls at the Scudder Falls location stems from provisions added to the Commission’s federal Compact between 1984 and 1987. The Supplemental Agreement to the Compact was approved by Pennsylvania in 1984 and New Jersey in 1985. The U.S. Congress approved the changes April 1, 1987. On December 21, 2009, the Commission unanimously approved a resolution authorizing the agency’s Executive Director to “take all steps necessary to toll the Scudder Falls Replacement Bridge.“ A subsequent 2010 Federal Highway Administration (FHWA) legal opinion confirmed the Commission’s tolling authority at the Scudder Falls location “so long as the bridge is replaced, and the impacts of tolling are considered under NEPA (National Environmental Policy Act).” (This final stipulation was addressed through the project’s EA Addendum.) In September 2012, the FHWA informed the Commission that a tolling agreement was not required for the replacement bridge under the federal transportation funding law (MAP-21). 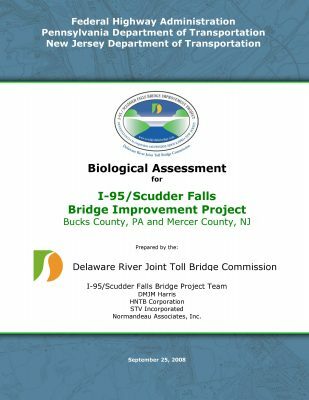 The final Level III traffic and revenue forecast document for the Scudder Falls Bridge Replacement Project was issued on February 7, 2017. This revision of the prior 2014 Level III study was provided to prospective project bond purchasers as part of the official disclosure statement issued on February 14, 2017. 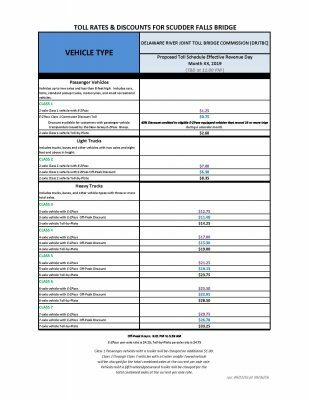 The revised Level III traffic and revenue study includes modeling assumptions intended to achieve a 90-percent confidence level in traffic and revenue forecasts. By definition, the work, analyses and forecasts in this document were of investment-grade quality and were a necessary prerequisite for the acquisition of project financing – ultimately $430 million. 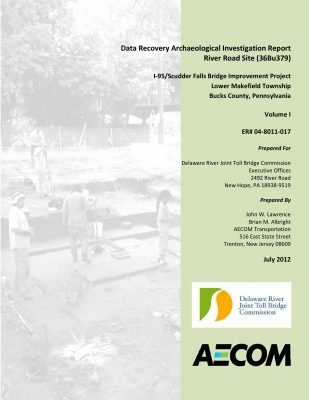 In October 2016, the Commission completed a pre-construction traffic study to meet the terms of an Interagency Agreement the Commission forged with the Pennsylvania Department of Transportation (PennDOT) and New Jersey Department of Transportation (NJDOT) in April 2012. 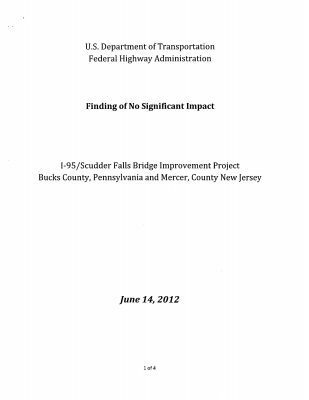 This study assessed the existing conditions of various intersections, roadway segments, interchanges and bridges in the vicinity of the Scudder Falls Bridge. 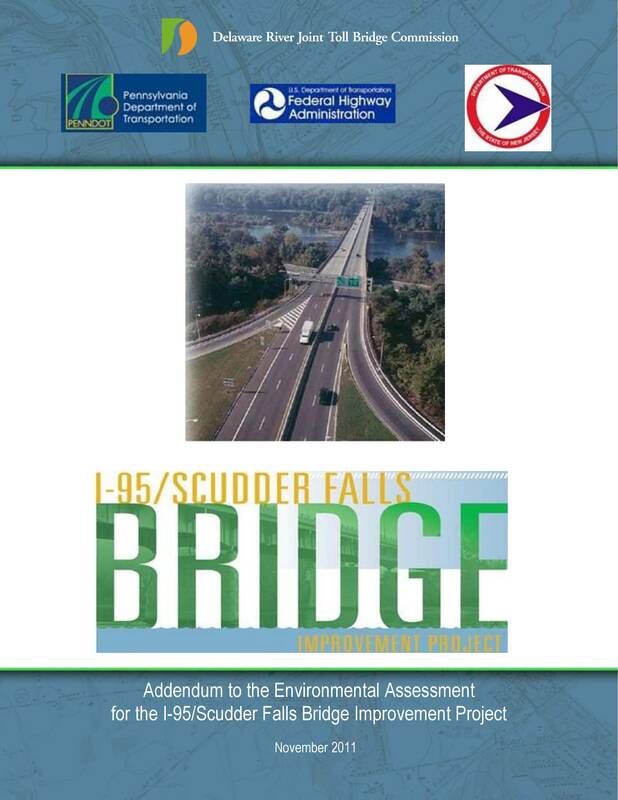 This study will serve as the baseline for purposes of determining traffic diversion impacts from tolling at the Scudder Falls Replacement Bridge. The report includes an Executive Summary and the full study including appendices of the collected data. 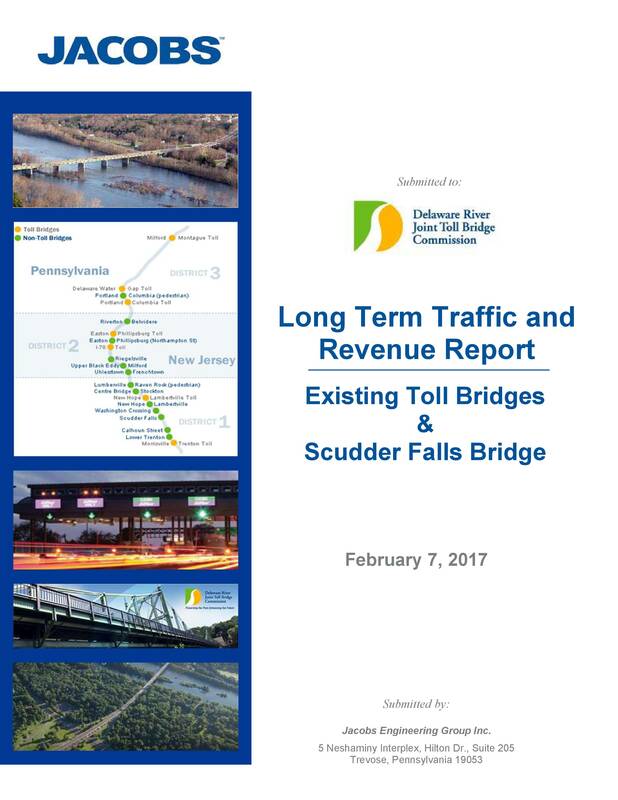 The Commission in October 2013 procured a Level 3 – Investment Grade Traffic and Revenue Forecast for its seven existing toll bridges and the envisioned Scudder Falls Replacement Bridge, which will be operated as a tolled crossing using all-electronic tolling technology (no toll booths). 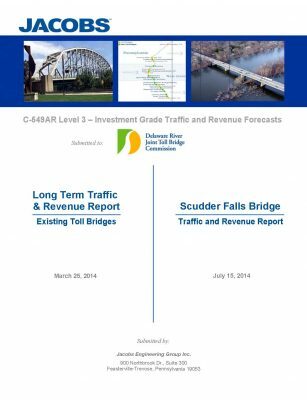 Fully completed in summer 2014, this study provided updated traffic and revenue projections to help guide Commission financial and project-authorization decisions. 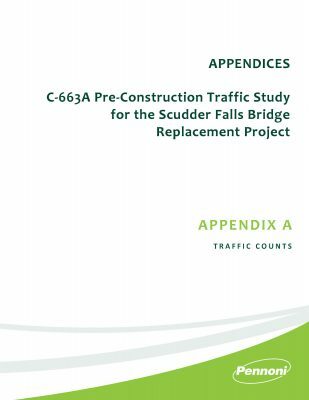 It also updated and expanded prior traffic analyses for the Scudder Falls Replacement Bridge. Investment-grade studies are considered a third-level of effort and complexity for determining whether a public transportation entity or specific facility has the requisite traffic revenue potential to attract and secure financing in the nation’s bond markets. The studies ultimately enable bond rating agencies to rank the credit worthiness of a project or government agency. 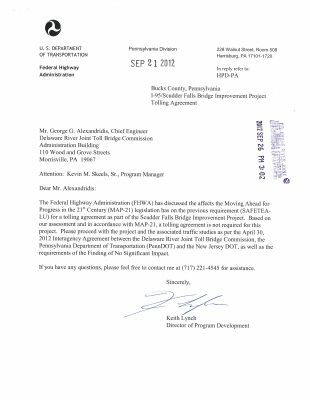 The document explains the project’s transportation objectives and identifies how the project will meet or exceed the eight access requirements identified by PennDOT guidance and consistent with the Federal Highway Administration’s Policy on Interstate access. 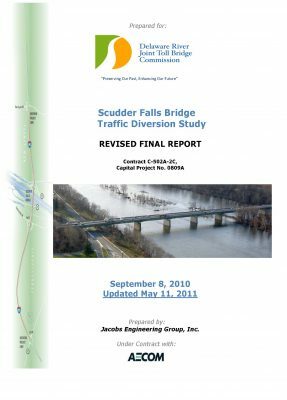 The document explains the findings of research conducted in 2010 and 2011 to determine the amount of traffic that will divert to other roadways and bridge crossings once tolls are implemented on the Scudder Falls Replacement Bridge. 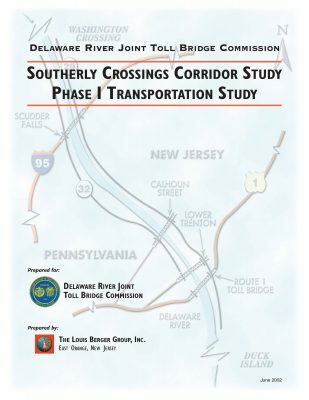 Among other things, the study indicates that toll-related traffic diversions will result in minimal impacts to other roadways and bridge crossings within the regional transportation network. The technical memorandum, prepared as part of the Environmental Assessment documentation and completed in November 2009, was compiled to assess the effects of anticipated traffic noise resulting from the project’s various improvements, using projected traffic calculations for the year 2030. 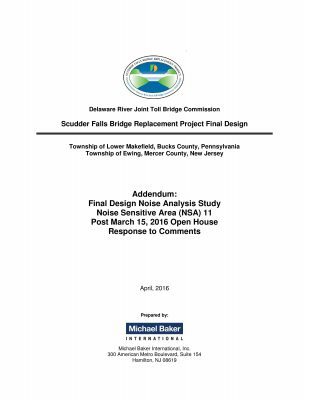 The report helped the Commission determine where consideration of noise abatement measures under the Scudder Falls Bridge Replacement Project is warranted, reasonable and feasible. 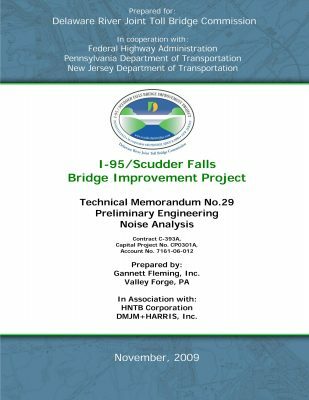 This report, completed in July 2015, provides a detailed analysis of the noise abatement walls approved during the Scudder Falls Bridge Replacement Project’s Environmental Assessment process. These noise mitigation measures are being carried over into the project’s final design stage. 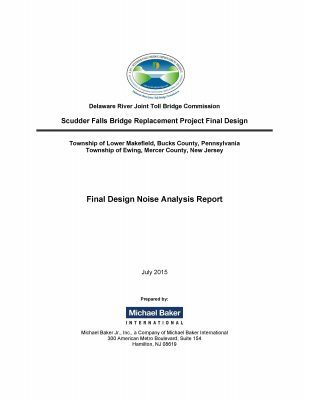 This report addendum, completed in April 2016, provides a supplemental analysis of updated noise measurements collected in three Lower Makefield, PA neighborhoods where noise abatement walls were deemed to be unwarranted during the Scudder Falls Bridge Replacement Project’s environmental documentation process. The supplemental noise analysis was performed after a December 3, 2015 project open house in response to the public involvement process. The findings confirm that noise abatement walls are unwarranted for these sections of Lower Makefield. 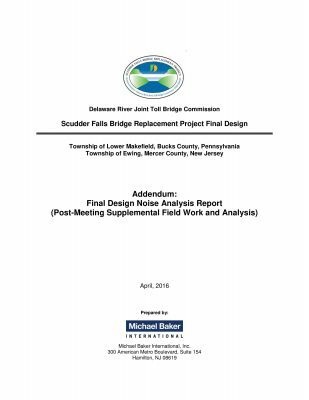 This report addendum, completed in April 2016, provides information in response to public comments received at the March 15, 2016 Open House/Public Hearing from Ewing, N.J. property owners downriver from I-95. This addendum describes how this area was analyzed for sound level impacts and the process for determining why noise abatement measures are unwarranted for this section of the community. This pivotal document was the project’s most significant regulatory hurdle. 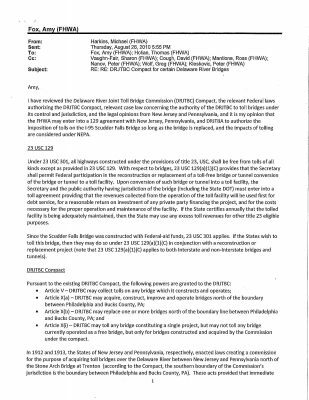 Issued by the Federal Highway Administration on June 14, 2012, the Finding of No Significant Impact (FONSI) validated the project’s extensive environmental documentation compiled by the Commission and the Scudder Falls Replacement Bridge project design management consultants. The decree officially completed the nine-year process of research, evaluation, public hearings and peer review regarding the project’s compliance with the federal National Environmental Policy Act. Most importantly, the FONSI allowed project preparations to shift to updating of project right-of-way plans, final design and eventual construction. Published in February 2012, this is the final document for legal sufficiency review under the Section 4(f) evaluation process. The document outlines the consideration of feasible and prudent avoidance alternatives for Section 4(f) properties (publicly owned parks, recreational areas, etc.) and coordination efforts with officials and agencies that have jurisdiction over these resources. This letter and accompanying documentation concerns project measures aimed at minimizing and monitoring project impacts on federal Threatened and Endangered species in the river. The opinion concludes that the project is likely to affect -- but not likely to jeopardize -- shortnose sturgeon in the project area. The 561-page Environmental Assessment (EA) was released for public review and comment on December 9, 2009. The EA includes environmental studies, preliminary engineering analyses, and explanations of various alternatives that were considered to reduce traffic congestion and improve safety on the Scudder Falls Bridge, its approaches, and adjoining interchanges. Prior to issuance, the document underwent extensive review by federal and state environmental resource and regulatory agencies with regard to project findings, assessments and mitigation for a number of environmental considerations within the project limits. This included historical and archaeological resources, threatened and endangered species, and wetlands, among other considerations. The public review and comment period for this document concluded on February 4, 2010. The document consists of three volumes. Project measures intended to mitigate effects upon historic and archaeologic resources are identified in this document. 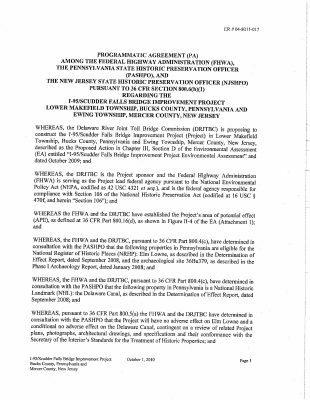 Besides the Commission, other parties to this agreement are the Federal Highway Administration (FHWA), the Pennsylvania State Historic Preservation Office (PASHPO) and the New Jersey State Historic Preservation Office (NJSHPO). The signing of this multi-party agreement was completed in November 2010. This report was completed by the Louis Berger Group in August 2002. 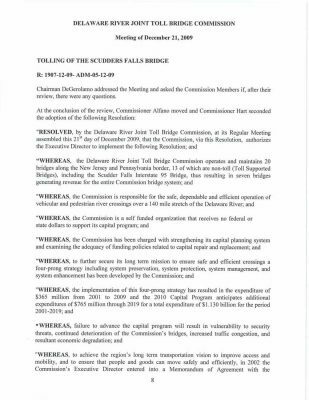 It concluded that “there is a need to increase the capacity of the Scudder Falls Bridge to achieve acceptable traffic flow conditions on the facility, regardless of what investment choices were made on other bridges in the study area. This MOA document was signed by all parties in January 2003. 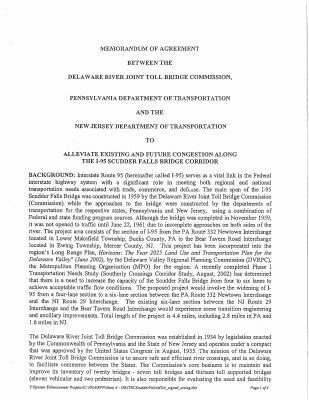 Under this tri-party agreement, the Commission and the Departments of Transportation in New Jersey and Pennsylvania created a partnership to work with the Delaware Valley Regional Planning Commission to alleviate current and future traffic conditions along the Scudder Falls Bridge and its immediate highway corridor. The MOA formed the basis of the development of the replacement bridge project’s Preliminary Engineering and Environmental Documentation phase. 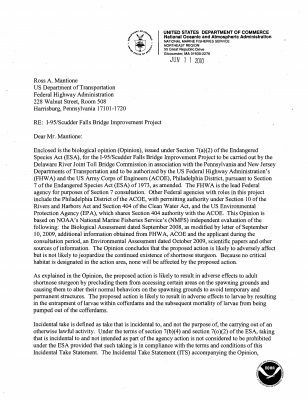 It was agreed that the Federal Highway Administration (FHWA) would be the lead federal agency for preparation of an Environmental Assessment (EA) under the National Environmental Policy Act (NEPA).